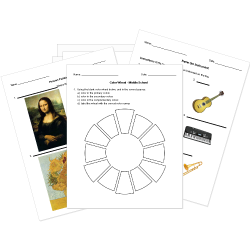 You can create printable tests and worksheets from these College Arts questions! Select one or more questions using the checkboxes above each question. Then click the add selected questions to a test button before moving to another page. The role of the assistant lighting designer is the same across all companies and should follow USITT standards for job responsibilities. which one of these are true about aboriginal art? A natural sign cancels out a sharp or flat sign. A sharp raises the pitch one half step and a flat lowers the pitch one half step. Pablo Picasso was born in what city? Melody is the aspect of music. What was the most common occupation (other than composing!) for composers in the Baroque era? The following musical example is using which rhythmic devise in measures 3-5? Careful manipulation of light and shadow. Much of the music written in the Baroque era, especially vocal music, was written specifically for the church, especially the and . What colors are produced by mixing two primary colors in varying proportions?